CINCINNATI, Ohio -- A University of Cincinnati police officer who shot a motorist during a traffic stop over a missing front license plate was indicted Wednesday on a murder charge, with a prosecutor saying the officer "purposely killed him" and "should never have been a police officer." Hamilton County prosecutor Joe Deters announced the grand jury indictment at a news conference to discuss developments in the investigation into the July 19 shooting of motorist Samuel DuBose by Officer Ray Tensing. Authorities have said Tensing spotted a car driven by DuBose and missing the front license plate, which is required by Ohio law. They say Tensing stopped the car and a struggle ensued after DuBose refused to provide a driver's license and get out of the car. Tensing, 25, has said he was dragged by the car and forced to shoot at DuBose, 43. He fired once, striking DuBose in the head. But Deters dismissed Tensing's claim he was dragged and suggested he shouldn't have pulled DuBose over to begin with. "He fell backward after he shot (DuBose) in the head," Deters said, adding that it was a "chicken crap" traffic stop. The University of Cincinnati said it fired Tensing after his indictment. Tensing turned himself in at the Hamilton County Justice Center and was processed on charges of murder and voluntary manslaughter. Tensing's attorney said he was shocked that his client was indicted on a murder charge. "I kind of expected he would get indicted for something, but I certainly didn't think it would be murder," attorney Stewart Mathews said. He said murder means purposeful killing and his client did not intend to kill DuBose. 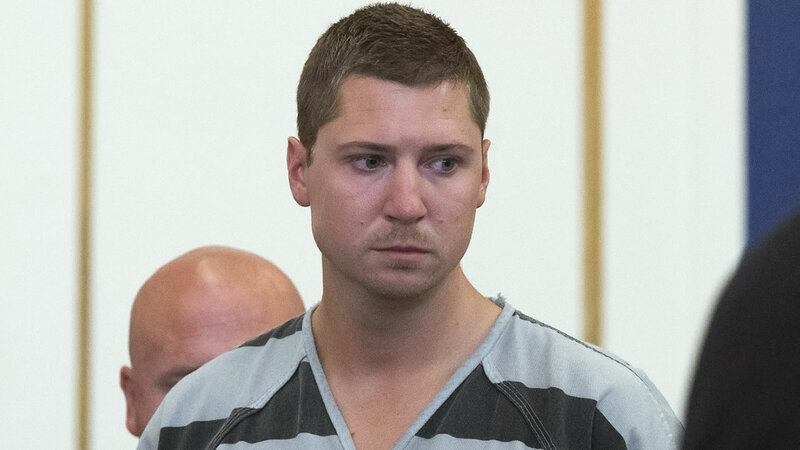 Tensing, who could face up to life in prison if convicted, has said he thought he was going to be dragged under the car and "feared for his life," according to Mathews. Mathews said a video from the body camera of a police officer who arrived right after the shooting shows Tensing lying in the street after he had gotten free of the car, but that video hasn't been released by authorities. "With the political climate in this country with white police officers shooting black individuals, I think they need somebody to make an example of," Mathews said. DuBose's death comes amid months of national scrutiny of police dealings with blacks, especially those killed by officers. DuBose was black. Tensing is white. Authorities haven't indicated whether race was a part of the investigation. DuBose's family had pressed for release of Tensing's body camera video, and news organizations including The Associated Press had sued Deters to get it released under Ohio open records law, but Deters released it before any ruling was made. Deters called the shooting "senseless" and "asinine." "He purposely killed him," Deters said. "He should never have been a police officer." The prosecutor also said he thought it was time to reconsider the UC police department's role. "I don't think a university should be in the policing business," Deters said. A message for comment was left Wednesday with the police department. The university said earlier this week it plans an independent review of its police department's policies. The UC officer made the traffic stop near the university's main campus, and UC police have said the intersection was within the campus police's jurisdiction. DuBose family attorney Mark O'Mara, who represented George Zimmerman following his shooting of Trayvon Martin, called for a "peaceful and nonaggressive" response from the community after the officer's indictment. He said the family wanted a peaceful reaction because "Sam was a peaceful person." A rally held by the activist group Black Lives Matter drew a large crowd outside a courthouse Wednesday evening. The rally appeared peaceful, with some people holding up signs calling for justice for DuBose. Tensing has more than five years of experience in law enforcement and has worked as a University of Cincinnati police officer since April 2014, UC police Chief Jason Goodrich said. He formerly worked as an officer in the suburban village of Greenhills.